As part of the ‘La Tête et les Jambes’ programme, the French Institute welcome the performer Anne Dolorès Marcélis in Edinburgh, with the support of Wallonia Brussels International. 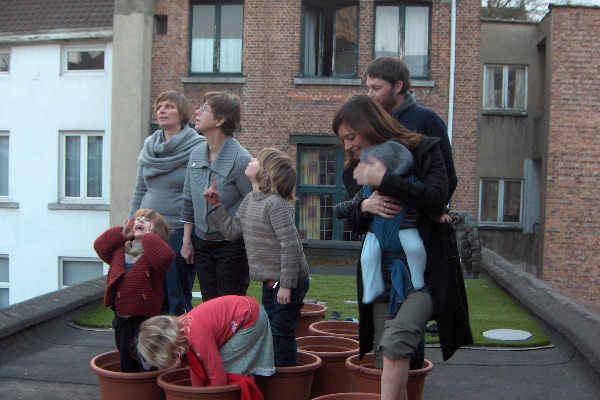 Anne Dolorès invites you to plant not cabbage... but yourself! A PREMIERE in the UK for this public event which has already been very successful in the cosmopolite city of Brussels. The Edinburgh Plantaison Collective will be held on Sunday 22 April from 11.00 am to 1.00 pm in a secret location!. It will be preceded by an experimentation workshop on Saturday 21 April (2.00 pm to 4.00 pm) in the Princes Street Gardens Gardens that will allow participants to try out the ‘feet put into the soil’ exercise at one’s own pace. The only thing you need to do is to bring you own pot and a bit of soil (just enough to cover your feet up to the heels) and to register in advance so that Anne Dolorès can organise herself! And, like a plant, to have nothing to do but to be. Then the landscape around us changes. From the feet, we start contemplating. 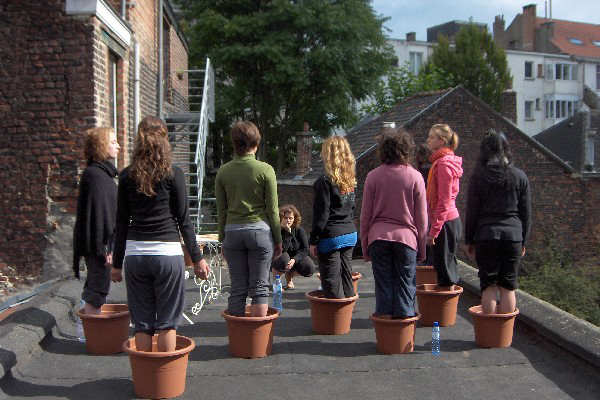 Anne-Dolorès Marcélis’ ‘Plantaisons Collectives’ are experiences/performances open to everyone and created to experiment the connection with the ground. 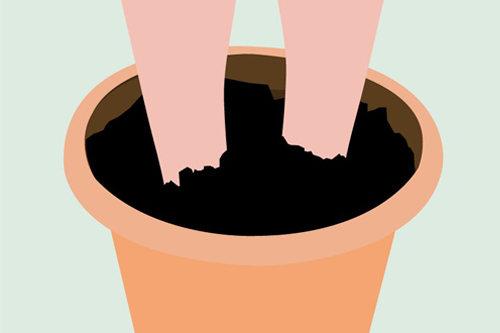 In a pot or directly into the ground, the planter/performer is invited to put his/her feet into the soil and to stay still, ‘not doing anything’, for an indefinite amount of time. 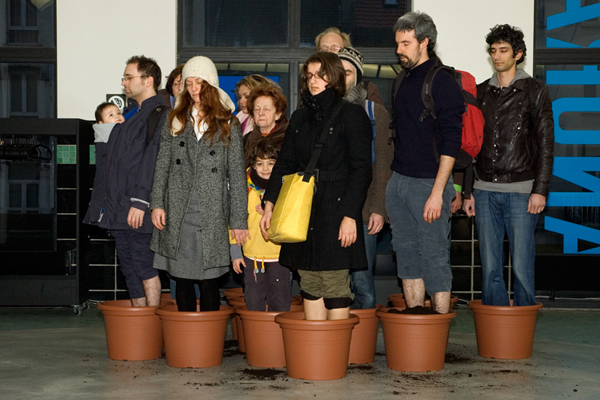 Lived as a physical, meditative, personal or shared practice, planters experiment the vegetal World stillness, a feeling that gives full force to the concept of “Human mobility”. After each planting, performers are invited to share their experiences with each other over a drink. Anne-Dolorès Marcélis was born in Santiago de Chile in 1970 and lives in Belgium. She combines her experience of researcher (she has a PHd in History) and dancer (Contact Dance technique) to perform as a societal Historian. Her works results of the blending between City, History, Nature, writing and dance studio. The ‘Plantaison Collective’ performance (Canvas Collectie-La Collection, Bozar, May-June 2010) keeps on spreading around a variety of events. She has published a number of studies on History of society and dance performance. In October 2011, she had founded ‘Camping Town’, a creation and hosting space for artists composed of individual tree-houses and located in the centre of Brussels. Visit her website for more information about her work.